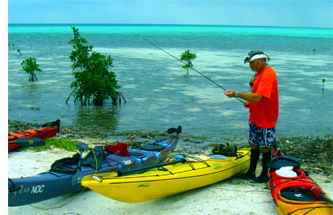 Can’t decide between windsurfing, fishing, rafting, snorkeling, caving, or kayaking on your next adventure? Who says you need to? If you are in seeking an active vacation based out of your own private island, then start packing your snorkel gear! There’s a little slice of paradise with your name written in the sand; it’s called Adventure Island at Glover’s Reef, 35 miles off the coast of Belize. And it doesn’t hurt that the water is 80 degrees. Slickrock Adventures bought the island in the early 90s. 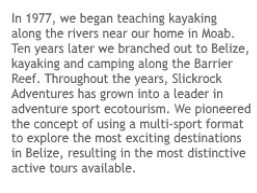 The owners (that’s us) are former river guides from the Western US, and we have created a premier Belize resort, with more water sport toys than any other location in Central America. Multisport vacations in desirable locations are becoming one of the hottest segments of the travel industry, and the more sports the better. Slickrock’s Belize Adventure Week, an 8-day, action-packed itinerary, will satisfy both the athlete AND the escapist in you. This adventure tour starts out at a jungle lodge in the Maya Mountains. 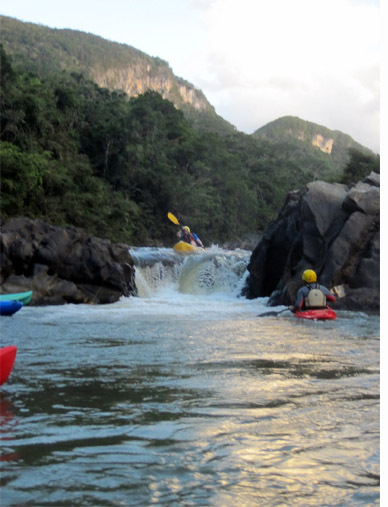 Over several days you explore a whitewater river by kayak, an underground river by raft, Tikal Mayan temple in nearby Guatemala, and a Mayan ceremonial cave, deep in the jungle. After all this activity it’s actually relaxing to arrive on the island where you only have sea kayaks, surf kayaks, windsurfers, and paddle boards waiting for you. You can paddle off to some coral patch reefs or receive windsurfing and kitesurfing instruction from expert North American and Belizean guides. This eco-lodge is powered by the sun and wind with a little bit of propane thrown in to cool the beer. Beach front cabanas perched right over the surf will have you belting out the words to Gilligan’s theme song in no time. 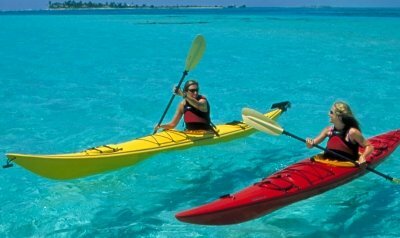 This all inclusive Belize package is offered weekly from December – April.